Ever since this blog was started, many of you have been asking a lot of great questions. Questions about backyard beekeeping, the Warre Top Bar Hive, how to keep bees naturally…the list goes on! After a while, I realized that I was being asked a lot of the same questions over and over. Which is good! It means that you are thinking about how to keep bees in a sustainable manner. I like that! The bees like it too! So, in order to answer your questions in a better fashion, I packaged a lot of the most common questions in a free Quick Start Guide to Natural Beekeeping. I need your help to make this Quick Start Guide better. Go grab a copy at http://diybeehive.com and read it. Then, post your thoughts about it in the comment area below. How did you like it? Did it answer some of your questions? Do I need to expand it in certain areas? Do you think it is helpful? The more feedback you leave, the more often I can update the Quick Start Guide according to your wishes…and as a thank you I will send you a fresh copy of the Guide every time it is updated. So, download your copy right now, then come back and tell me what you think! Here is a great article that I thought you might find interesting. Enjoy! I’ve a reasonable library of beekeeping books, and a couple of years ago I was reading an old book which mentioned listening to your bees to see if they are going to swarm. It told of how a queenright colony, when their hive is sharply tapped upon, will react by ‘hissing’. I believe the hiss is the bee equivalent to a warning signal, generated by a section of the population fluttering its wings in response to the vibration caused by the tap. This is an interesting question…do honey bees need to “evolve” a response to varroa, or do they already have an instinctive response to the varroa mite? It seems that some bee strains do indeed have an instinctive response to the varroa mite, and this genetic trait can be passed along to other strains through selective breeding. Honeybees are in trouble. Varroa mites, nosema, colony collapse disorder and foul brood have all taken their collective toll on the small but hardworking insect to which humanity owes so much. Besides furnishing honey for commercial bread-baking and beeswax for quite a few of the top of the line cosmetic supplies, bees regularly pollinate over one-third of the world’s agriculturally derived food supply. Needless to say, humanity depends on the lowly honeybee. On Tuesday, April 22, 2008, I installed a package of bees in the first Warre Hive here in Northern Colorado, USA. It has been one week since then, and the bees are happily living in their new home. They have been bringing in a good bit of pollen and and nectar. There is a creek in the gully near the hive, so I do not need put out any water for them. This spring (2008) I am experimenting with a new beehive design. Since I started beekeeping, I have always used the standard ten frame Langstroth hive which is predominant here in America. 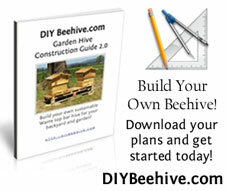 In the fall of 2007, I learned of a new hive design through the Organicbeekeepers Group on Yahoo. This new hive design was named after its developer, Emile Warre.